Worklogic’s Rose Bryant-Smith honoured as a finalist in Telstra’s Business Women’s Awards. Worklogic’s Melbourne office moves to new premises at 459 Collins Street. 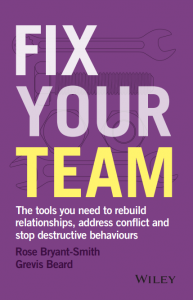 Launch of new book ‘Fix Your Team‘, co-authored by Rose Bryant-Smith and Grevis Beard and published by Wiley and new Fix Your Team website. Launch of the second edition of “Workplace Investigations‘, published by Wolters Kluwer. Publishes the 50th edition of its popular e-newsletter, read by more than 10,000 managers and leaders at organisations around Australia and across the world. Moves into larger premises in North Sydney to accomodate our growing practice. Worklogic celebrates its 10th anniversary on 2 July, 2017! Three new Associate Directors, Kairen Harris, Jodie Fox and Lisa Klug are appointed in Victoria to manage rapid growth. Publishes first book, Effective Workplace Investigations: A Practical Guide for Australian HR Professionals, to rave reviews!